Copper caldrons like in the good old days, also suitable for cooking over an open fire. Hand-forged copper caldrons are our speciality! We really do forge these lovely copper kettles for cooking, even nowadays. Or maybe you would like to use our caldrons for decoration. Our copper caldrons are used for many traditional dishes. For example, Italian polenta or Galician squid stew are usually cooked in plain copper. Also fondues, all sorts of stews, desserts or the famous brandy punch (Feuerzangenbowle) are most successfully prepared in copper. Cheese is also best made in special copper pots, since the the copper prevents further fermentation and ensures fast ripening and full flavor. The same is true for brewing beer, or try making roasted almonds without using copper... As opposed to our modern copper pots with flat bottoms, the copper cauldrons are especially suitable for cooking over an open fire (or on a gas stove). Because of the original appearance, our copper cauldrons are functional, and at the same time ornamental elements for stylishly decorated rooms. They are ideal for Christmas and medieval markets, restaurants with particular themes, and other establishments with a special atmosphere. 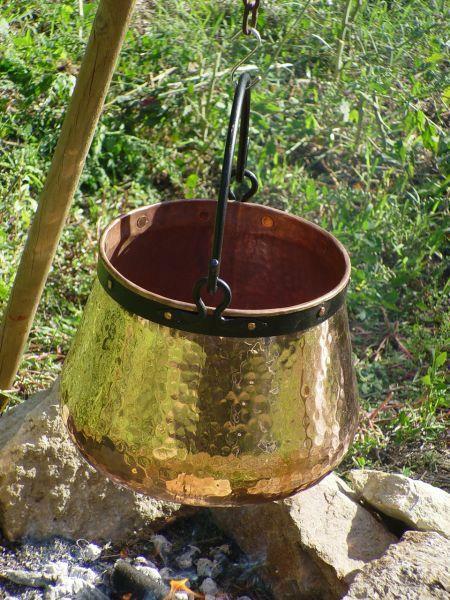 Many a witch or Druid would certainly be proud to be able to own such a copper cauldron.